Football has always been accused of being somewhat romantic, even in the modern age where money rules the roost, and this can sometimes be its greatest flaw. And as money does become much more prevalent in the game, players who seem to ‘just get the club’ are an endangered species, players who bring problems of the strangest kind, players like Juan Mata. Mata’s talent has never been questioned. 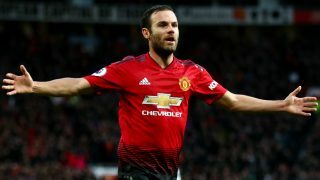 From the free kick he scored against Newcastle in his early days as a Red Devil all the way through to his last touch of excellence, Mata has consistently showcased why his signing was so celebrated all those years ago. But as the years fall away, so does a yard of pace in his game, game time is harder to come by, and managers and styles of play come and go and suddenly an extremely talented footballer becomes obsolete. Where is the peculiar problem? It just may be that Juan Mata may be the nicest man alive, his passion for all things United endear the fans to him like no one else and the thought of him leaving is almost unbearable. But the simple fact is now is the best time for all. This all comes from speculation in The Sun (and many other outlets) that Barcelona are eyeing up the Spaniard for a return to his home country on a free transfer this summer, as his contract at Old Trafford comes to an end. It’s created something of a dilemma internally for supporters for the very reasons I stated above, not many players are left that can speak so romantically about Manchester United and not have the integrity of his words questioned – you really believe everything he says about life in red. But if life at the top has no room for sentiment, then a club trying to reclaim former glories has the door vacuum packed closed, Mata is getting on a bit, he’s beginning to hinder rather than help. Ole Gunnar Solskjaer gave us a glimpse of what the football he wants to play is. He wants fast, zipping passing and rapid counter-attacks (cast your minds back to before things regressed a little) that players like Mata simply cannot adhere to anymore. The former Chelsea man is finding himself either forced wide right (where he is largely ineffective these days) where he may not be needed to contribute quite as much, or labouring in his favoured number 10 role as the play rushes on by, a passenger on a bus he used to drive. Even chances from set pieces are becoming a premium for him, in spite of his sporadic success in such situations. Juan Mata is one of those people who deserve the best to happen to them. Talk to someone who has met him, they’ll tell you the same thing as each other. Look at his criminally under-supported charity he set up off his own back for the wider footballing community. Read the things he says in his blogs, and listen when he speaks. He is a genuine bloke with whom I might well have fallen head-over-heels in love with over the course of his 6 years at United, but I can’t have him along down the football anymore. I cannot get to the point where I am bemoaning his inclusion in the starting 11. As hard as it may be to say aloud, it’s time for him to depart, and Juan you can take my word for it, you will be missed.